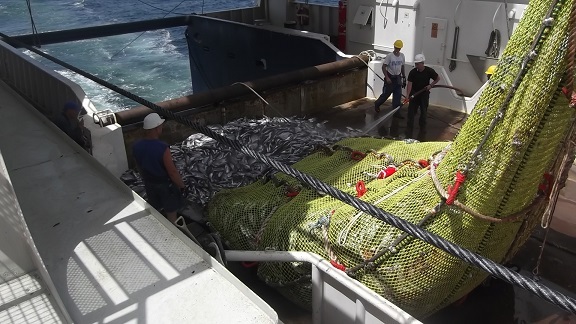 Accurate weighing on board a seagoing fishing vessel isn’t easy. The ship is continuously rolling and stamping because of the waves. The motors, hoisting tools, winches, etc. cause multiple vibrations. Using existing instrumentation, Penko Engineering developed a weighing system with built-in compensation for these disturbing effects. This arithmetic compensation is possible due to the unmatched high measurement speed and internal resolution these instruments possess. The availability of a reliable weighing data is the basis for dosing the captured fish in batches. In practice, thanks to this method, it appears possible to assemble the batches of fish with, for these conditions, a high accuracy of ≤1%. Because the batches are carefully dosed, the fisherman reduces give away due to overweight, and does not need to freeze it either. That results in twice the profit and a more environmentally friendly system. With the Penko program TP Datareporter the weighing data is immediately available, recorded, and processed. This turns measurement results into knowledge.